March 20th is the vernal equinox, which is the start of the spring season in the northern hemisphere. Everyone is excited about temperatures warming, flowers blooming, and birds returning. I on the other hand only want to know one thing, how much snow did we get? Has at least 40 years of data. 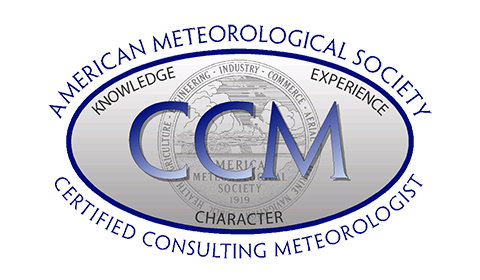 Has good data between 1981-2010 (to calculate a 30 year climatology). 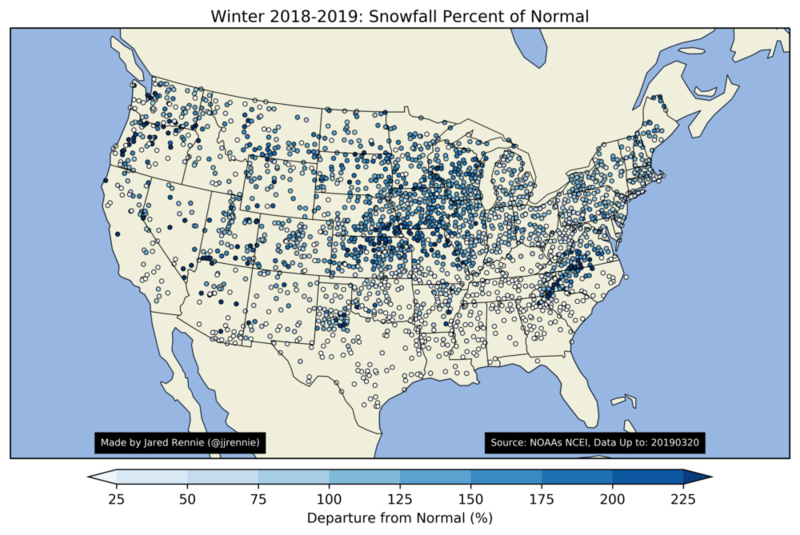 Has 90% of days reported in the 2018-2019 Snowfall Season (October 1st - March 20th). This brings the amount of stations down to 2,300, but still has enough coverage for the contiguous 48 states to make an assessment. While Alaska had some interesting results, they are not used in this analysis. Paradise, Washington, which is on the south side of Mount Rainier, takes the winner as the snowiest site in the United States. It’s value of 440” is more than 50” above the next record, which is held by Alta, Utah. The top 10 stations are located in the western part of the United States, with two in Michigan. The first New England station does not show up until 14th (Mt. Washington Observatory in New Hampshire, which reported 186.5”). Below is the snowfall accumulation plot for Paradise Washington. The amazing thing to note is that 440” doesn’t even come close to its own record. The black line is the current season in question (2018-2019) and is compared to all of its other years. The light blue line at the bottom is its least snowy season on record, and the thick blue line near the middle of the pack is what one expects. So 440” is considered below its climatological average of 670.8”. The snowiest season it ever experienced was in 1971-1972, when it received nearly 1,150” of snowfall! This again reinforces the notion to look at deviations in measurements, rather than the absolute values, as they can be misleading. The snowiest station in the US this season was in fact a lower than normal season for Paradise Washington. To illustrate deviations, we can compare the season value to its climatological average (here defined as 1981-2010) in two different ways. A departure from normal (known as an anomaly), or a percent of normal. Below indicates the anomalous values. Reds indicate higher than normal snowfall, and blues indicate lower than normal. There’s a little more noise in this image, but there is a cluster of reds in a good portion of the Midwest. Parts of Kansas, Nebraska, and Missouri appear to have higher than normal values, something that was not indicated by looking at absolute values. But this methodology also has problems when it comes to snowfall. The map above only ranges between -25 and 25 inches. In the Paradise, Washington example, the anomaly was -230.8” (440-670.8). A value of -230 is going to get the same shade of blue as -25, a value nearly ten times smaller. For rainfall and snow, it’s usually better to calculate percent of normal. This helps filter out areas that may have higher snowfall totals climatologically, such as mountainous areas. For Paradise, the percent of normal becomes 65.6% (440/670.8). Below is the percent of normal for the 2018-2019 season. This is a better representation of how snowy a station was compared to its period of record. While results remain generally the same in the upper Midwest and Northwestern parts of the US, two interesting hot spots showed up. One in the Blue Ridge Mountains of North Carolina and Virginia, and the other in northwest Texas. Usually these areas get much less snowfall than their northern counterparts (sometimes they get none), but by using percent of normal, these areas can get a fair share when it comes to anomalous snowfall. Below are examples from Morganton, North Carolina and Northfield, Texas. While northerners might scoff at the NC and TX values (14” and 4.5” respectively), they typically see much less, (4” and 1”, respectively). This puts them well over 300” above normal for the season. Older PostThe Cloud: Why it's not scary, and why meteorologists should embrace it.